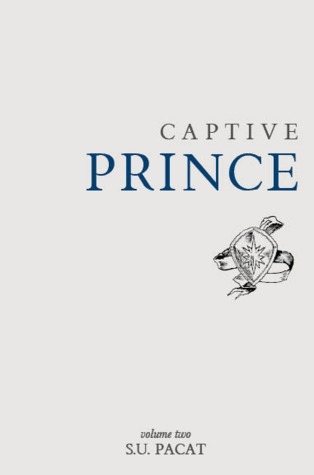 The alternate title for this book is called Prince’s Gambit and I prefer it much more than the ‘Volume Two’ because it sums up this middle book so well. Gambit <noun>: (in chess) an opening in which a player makes a sacrifice, typically of a pawn, for the sake of some compensating advantage. A device, action, or opening remark, typically one entailing a degree of risk, that is calculated to gain an advantage. So who do you think is the gambit? Too bad, you won’t find out unless you read the book. Laurent, hands down, dominates the game with the crazy tactics and strategies that he comes up with to subvert his enemies and stay three steps ahead of his uncle. The risk to his life is much more apparent as the Regent makes more indirect, daring attempts on Laurent. You thought Laurent was clever? WATCH THIS. He begins revealing just how deep his deceptions can go and readers see exactly how intelligent he is. Damen is also a warmonger and he’s very charismatic alongside Laurent. As a duo, they are a force to be reckoned with. They are very capable individuals that have commanding presences to capture the respect of an army. Laurent said it as though producing from the depths the answer to a painstakingly weighed question. ‘I can do this alone. I know I can. It’s only that right now I can’t seem to…think, and I can’t…trust anyone else to stand up to me when I’m…like this. If you could give me three days, I–‘ He forcibly cut himself off. Damen has always chafed under his shackles so it was eye-opening to see what he can do if Laurent gave him the keys. With a semblance of freedom, Damen shows his prowess…on the battlefield. HAAA, did you think I was going to say something else? Anyways, there’s a lot of sexual tension throughout the book and Pacat does it so well. The characters continue to develop and show a resilience in how they deal with tricky situations. The duo hit many problems along their travels but they stick together through them all. Although Laurent is secretive and holds many of his underhanded tactics close to heart, he still confides the most in Damen. Their slow buildup of trust was a wondrous thing to witness and in tough times, they really came to rely on each other’s strengths. I loved seeing Laurent push his army to their limits with drills and combat practices. Dealt with a rather lackluster set of cards, Laurent is showing his hidden sides that can transform even a rotten soldier into something respectable. So then comes the huge elephant in the room. How can Damen tell Laurent that he is Prince Damien, the one he loathes for killing his brother? He thought of Laurent’s delicate, needling talk that froze into icy rebuff if Damen pushed at it, but if he didn’t–if he matched himself to its subtle pulses and undercurrents–continued, sweetly deepening, until he could only wonder if he knew, if they both knew, what they were doing. Laurent’s fingers had tightened around the towel. There was a self-consciousness in him now, as though he had become aware of the strangeness of what he was doing: a prince serving a slave. Damen looked again at the cup of water, which Laurent had brought–for him, he realised. Laurent’s flush deepened. Damen shifted to regard him better. He saw the angle of Laurent’s jaw, the tension in Laurent’s shoulders. Laurent has a lot of tricks up his sleeves and he reminds me so much of a sterner, serious version of Eugenides from The Queen’s Thief by MWT.